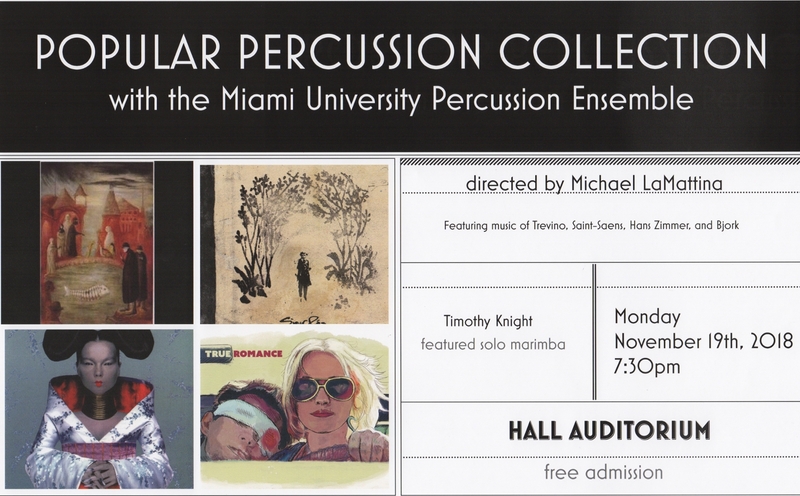 On Monday, November 19th, the Miami University Percussion Ensemble, directed by Michael LaMattina, will explore percussion sounds from bossa nova to anime and electronic synth in Popular Percussion Collection, a free concert in Hall Auditorium at 7:30 p.m. The concert will open with Aquarium by Saint-Saens; the eerie mood set by this first piece will carry into the next piece, Quintet for Percussion, composed by Miami faculty member, Michael LaMattina. Following the quintet will be a mallet sextet entitled Six by Ivan Trevino, whose music is strongly influenced by the Icelandic band Sigur Ros. The central portion of the program will feature Timothy Knight on solo marimba in a performance of Tiger Dance for marimba and percussion quartet. The music employs vigorous rhythms and exotic sounds to create an exciting showpiece for percussion. The final segment of the concert features “popular” music transcriptions and original music for percussion. Takahashi Hiroki’s Amandes Chocolat combines bossa nova and anime music that defies categorization. Bjork’s Joga adds to the contribution of artists from Iceland and will incorporate electronic synth and drum pad. You’re So Cool by Hans Zimmer from the motion picture True Romance offers a turn to highly tuneful music that will be sure to delight. The concert will end on an upbeat tone with Viva La Vida by Coldplay, one of the band’s most recognizable songs.